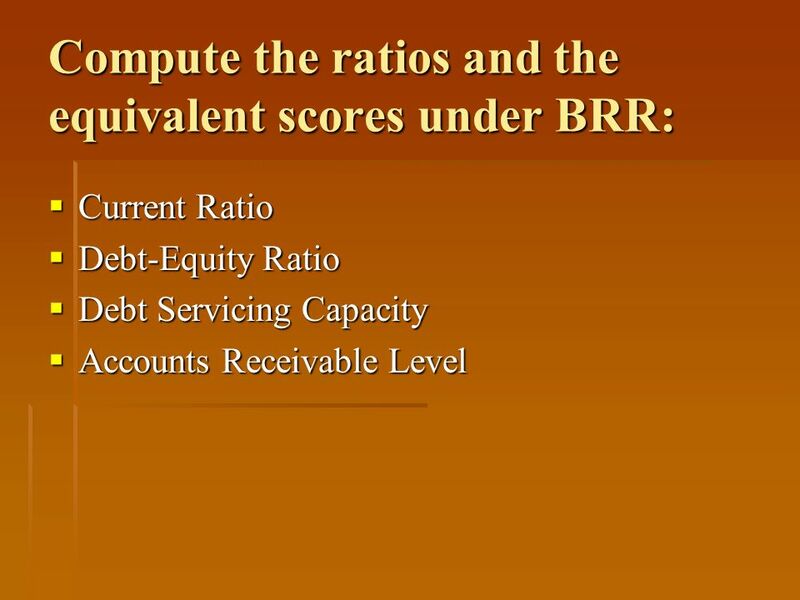 Some Financial Ratios Used in BRR. 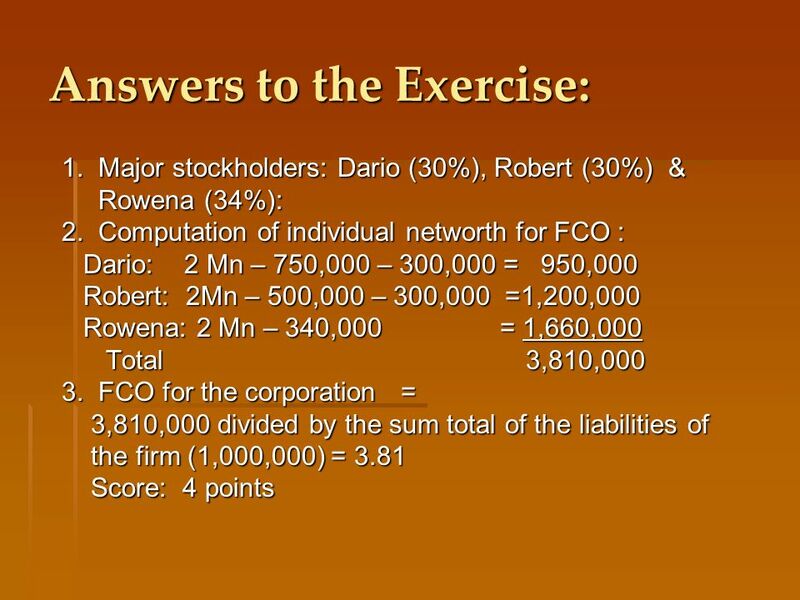 Financial Condition of Owner (FCO) Answers the question: What is owners capacity to put in more money when needed by. 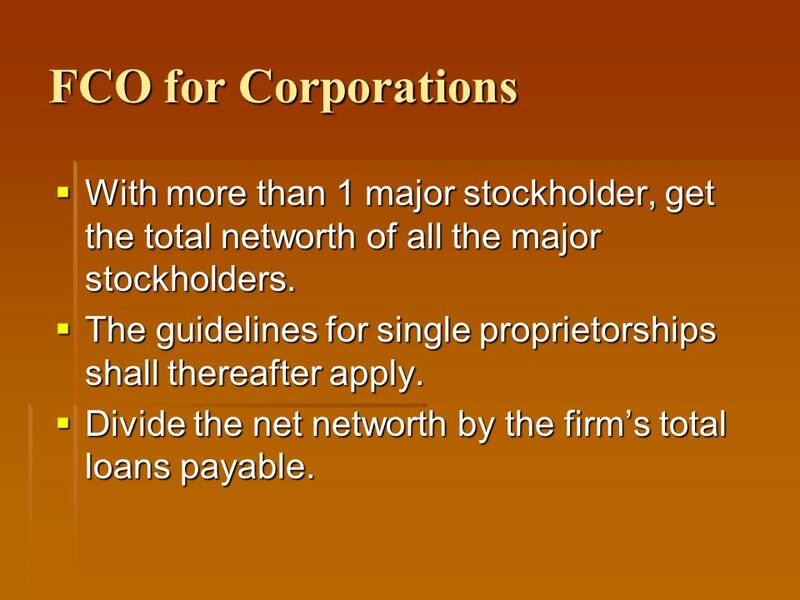 3 FCO for Corporations With more than 1 major stockholder, get the total networth of all the major stockholders. With more than 1 major stockholder, get the total networth of all the major stockholders. The guidelines for single proprietorships shall thereafter apply. The guidelines for single proprietorships shall thereafter apply. 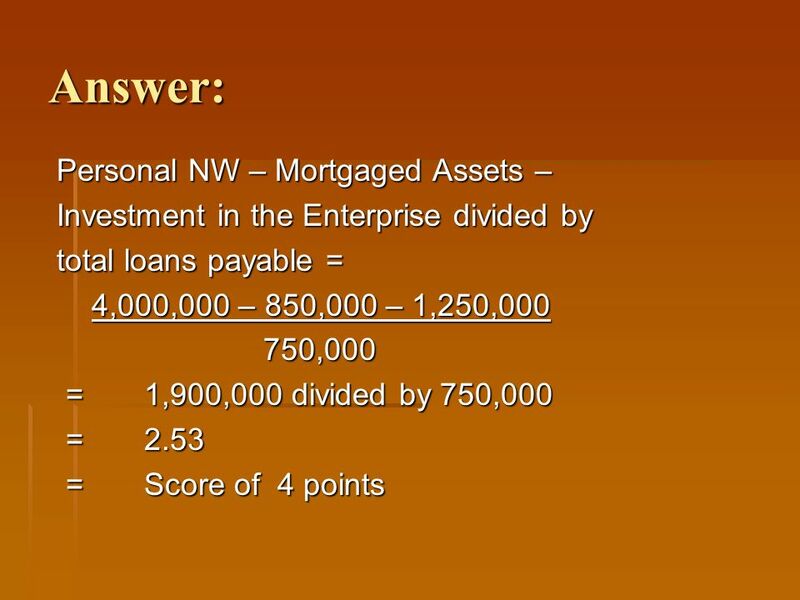 Divide the net networth by the firms total loans payable. 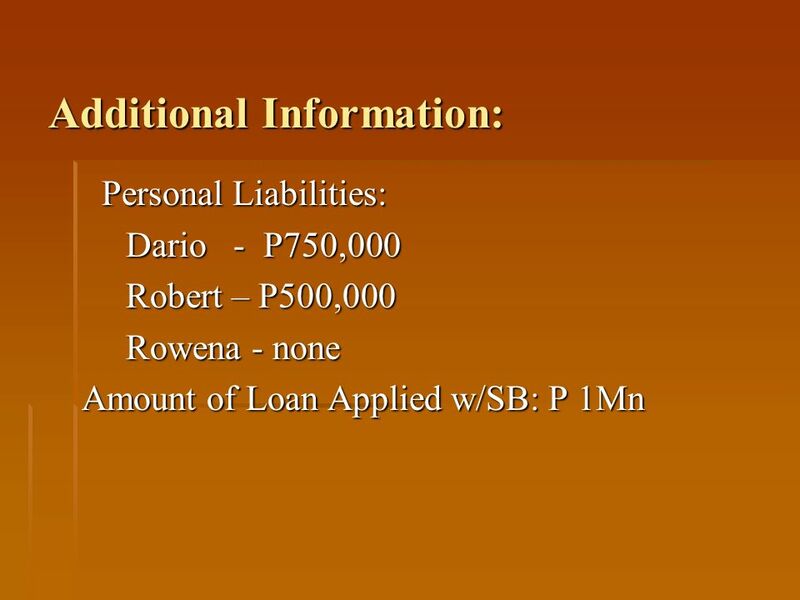 Divide the net networth by the firms total loans payable. 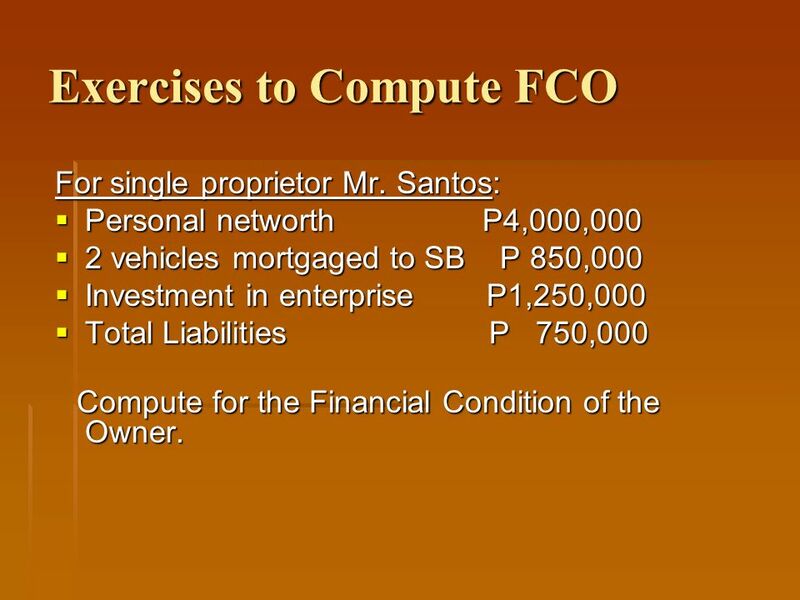 4 Exercises to Compute FCO For single proprietor Mr. Santos: Personal networth P4,000,000 Personal networth P4,000,000 2 vehicles mortgaged to SB P 850,000 2 vehicles mortgaged to SB P 850,000 Investment in enterprise P1,250,000 Investment in enterprise P1,250,000 Total Liabilities P 750,000 Total Liabilities P 750,000 Compute for the Financial Condition of the Owner. 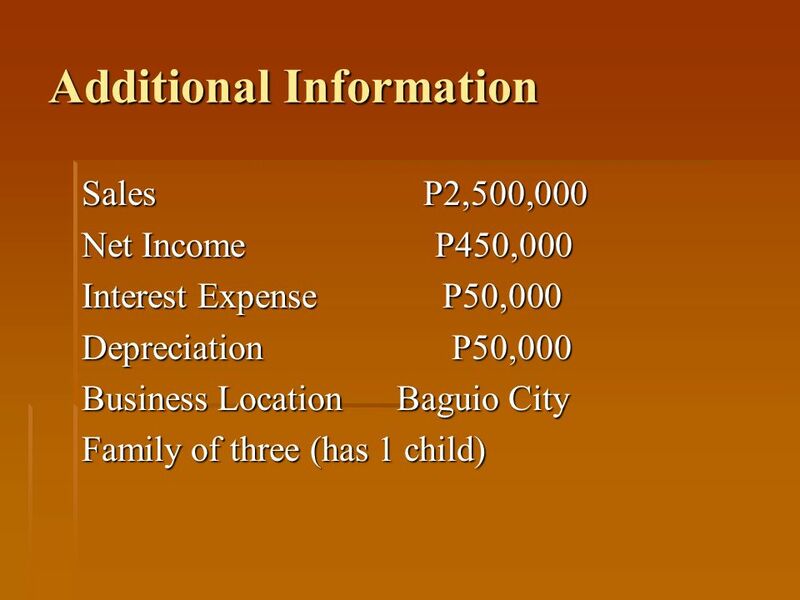 Compute for the Financial Condition of the Owner. 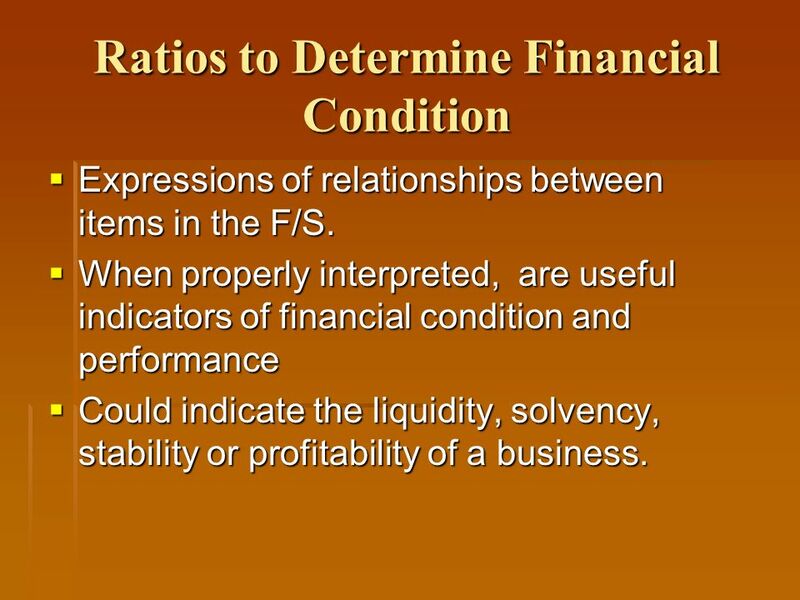 9 Ratios to Determine Financial Condition Expressions of relationships between items in the F/S. Expressions of relationships between items in the F/S. When properly interpreted, are useful indicators of financial condition and performance When properly interpreted, are useful indicators of financial condition and performance Could indicate the liquidity, solvency, stability or profitability of a business. 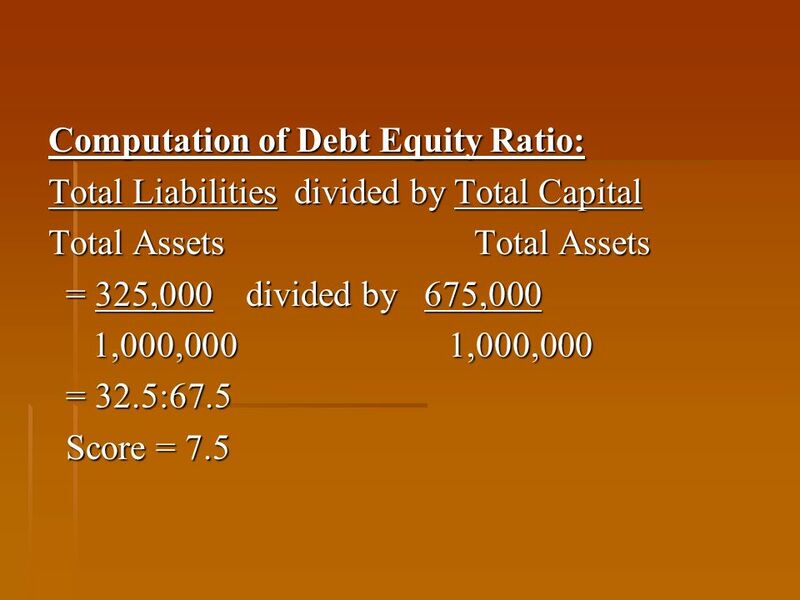 Could indicate the liquidity, solvency, stability or profitability of a business. 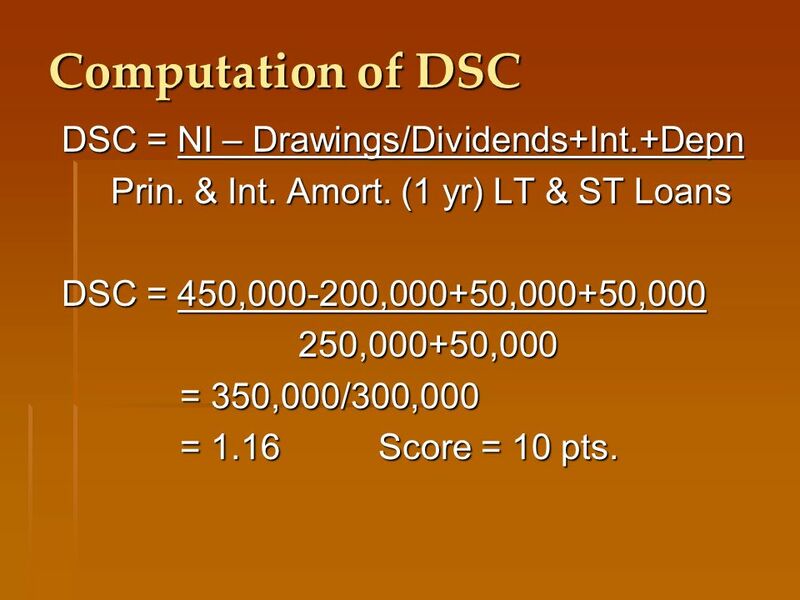 17 Computation of DSC DSC = NI – Drawings/Dividends+Int.+Depn Prin. & Int. Amort. 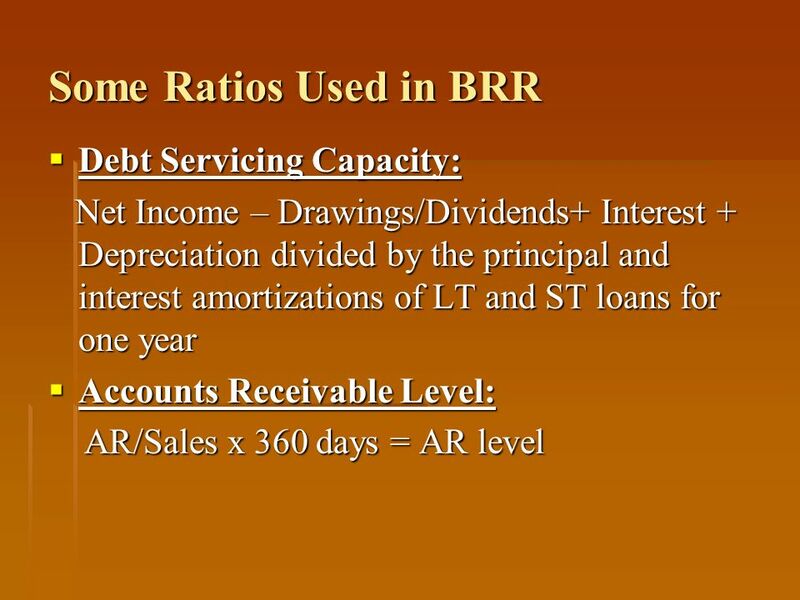 (1 yr) LT & ST Loans Prin. & Int. Amort. (1 yr) LT & ST Loans DSC = 450,000-200,000+50,000+50,000 250,000+50,000 250,000+50,000 = 350,000/300,000 = 350,000/300,000 = 1.16 Score = 10 pts. 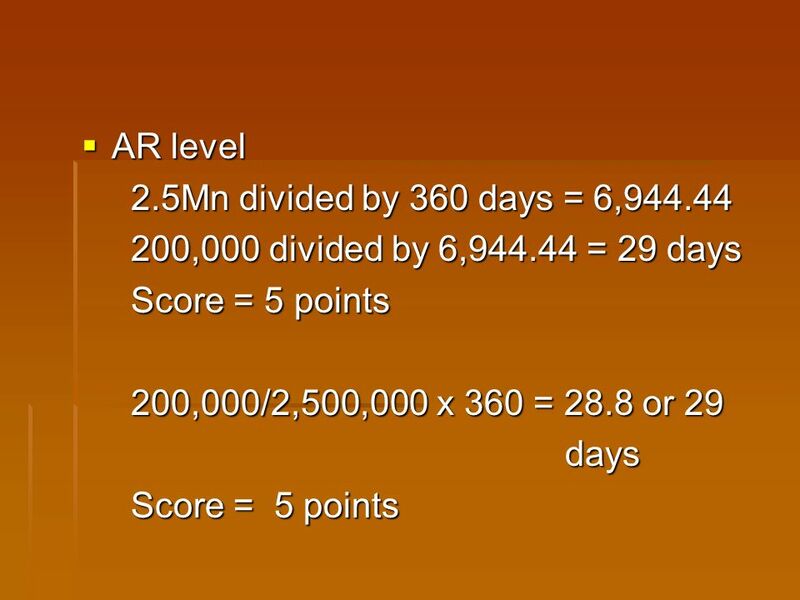 = 1.16 Score = 10 pts. 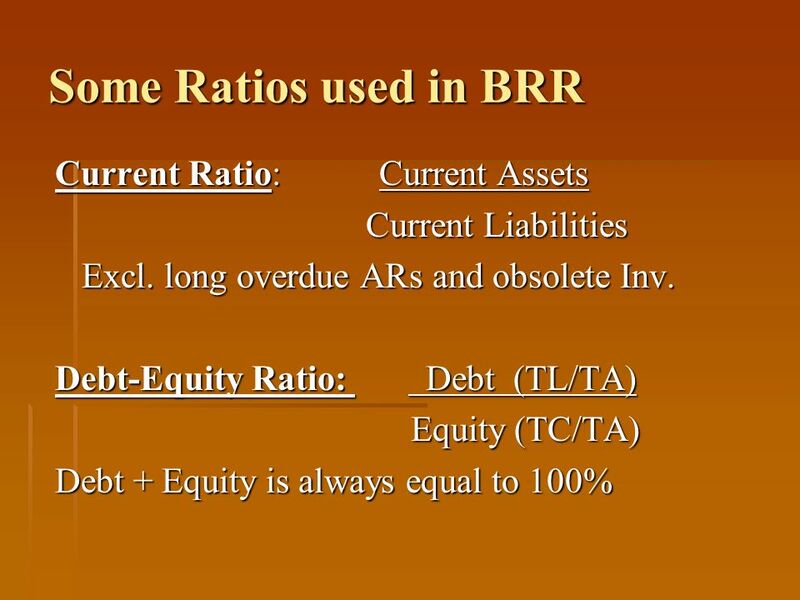 Download ppt "Some Financial Ratios Used in BRR. 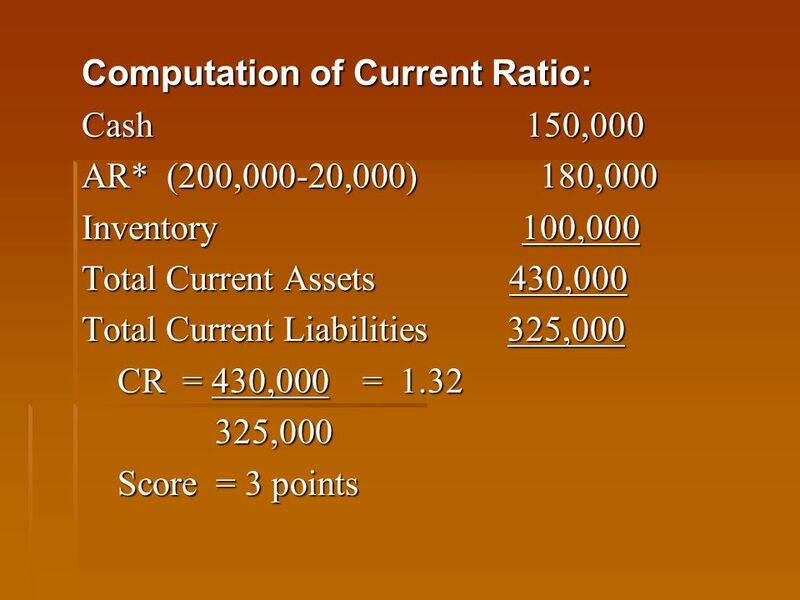 Financial Condition of Owner (FCO) Answers the question: What is owners capacity to put in more money when needed by." 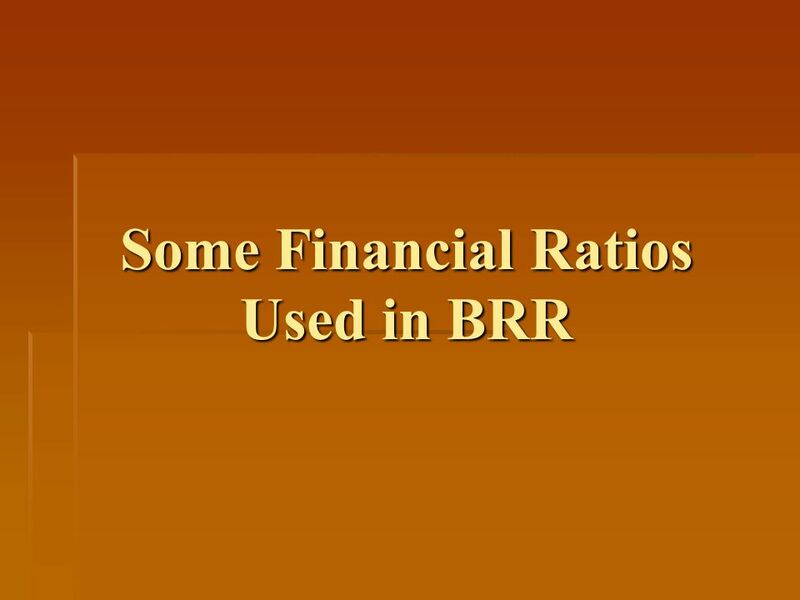 Financial Ratios Used in BRR February 11, :00 – 2:30 PM. Consolidation Week 3 u Inter -company transactions TEXT CHAP 16. Chapter 8 BBI1O1. Opening Activity What do you OWN? What do you OWE? What I OWN – What I OWE = Personal Net Worth. Ex. 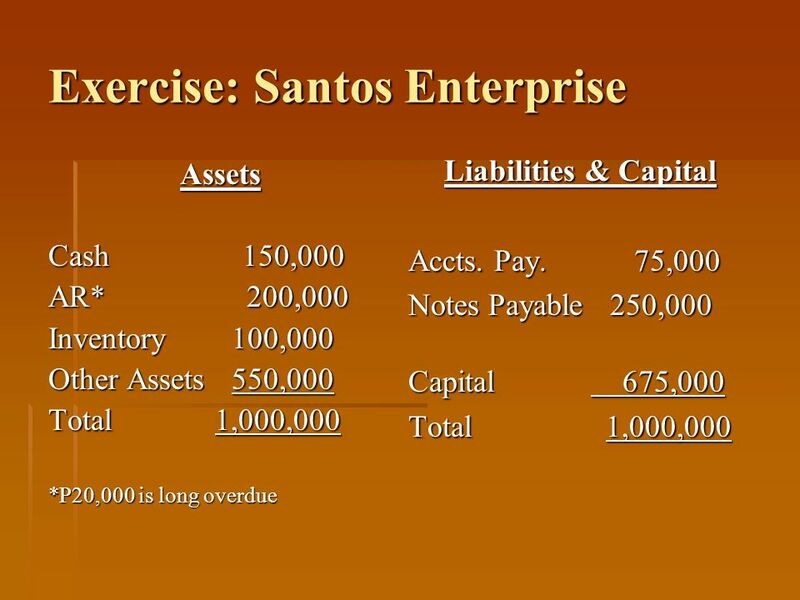 126 At the beginning of the year, Yates Company had total assets of $1,050,000 and total liabilities of $600,000. Answer the following questions.